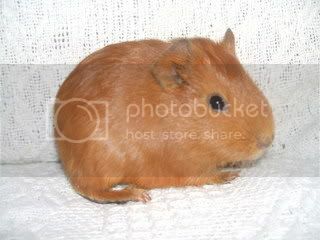 Has anyone had any experience with a guinea pig with fused hips? There is absolutely no need to get him neutered unless you already have a female you want to put him with. Otherwise, it is much safer to leave him intact. Neutering generally does not affect guinea pigs' personalities, and if you want to get a friend you can get another male (they are as likely to get along, given enough space, as two females) or adopt a spayed female from a shelter. Yeah I did pay for him, which I wasn't too happy with. But he didn't actually come from one of their breeders, he came from Staglands which is a wildlife park, and they inbreed (cos they're idiots and don't spay and neuter their bunnies or guinea pig's) and he's probably lucky that the people at Staglands didn't just have him euthanised... apparently he had scurvy when they got him! I'm sure that shelters do neuter to prevent them from breeding in the future. If you're controlling his future and being responsible, it's not needed, and I would hesitate especially since he already has so many problems. But of course your vet should know best (if you have a good one). I think he's lucky that neither the breeder nor the store just killed him off. And that he now has an owner who cares! Yeah I figure surgery on top of a disability would be hard. We still haven't been able to get my dog spayed, as she's had problems after problems and she's been sick most her life. But once she's had this last operation on her leg we'll finally be able to get her done! She's so curious about the guinea pig, (he ignores her!) we were going to name him "Bib," but it just doesn't seem to fit him.. so he's 'the guinea pig' at the moment, poor thing! I think his name is going to take a while, cos he's so special he can't have a boring name like my poor dog who got called 'Tammy,' which is a lovely human name, but not so great for a dog... a bit too common. This page was loaded Apr 23rd 2019, 2:14 am GMT.